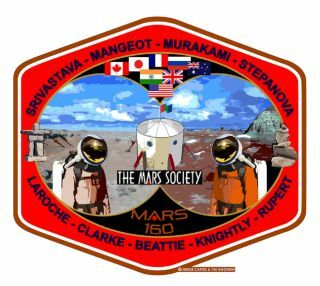 Patch for the Mars Society's Mars 160 mission, during which seven crewmembers will conduct 80-day simulated Red Planet missions in the Utah desert and the Canadian Arctic. On July 17, 2017, six explorers began an 80-day mission at the Flashline Mars Arctic Research Station (FMARS) on Canada's Devon Island, kicking off the second half of the Mars Society's ambitious Mars 160 simulation mission. The first half of Mars 160 took place in fall 2016, when the same core crewmembers spent 80 days at the Mars Desert Research Station in Utah, performing the same sets of experiments and fieldwork campaigns they will undertake at FMARS. Notes from Mars 160: Why on 'Mars' Are We Doing This? Mars 160 crewmember Paul Knightly lays out why the team's mission at the Flashline Mars Arctic Research Station (FMARS) in the Canadian arctic is important. Paul gives readers a tour of FMARS. Paul discusses getting used to life and work at FMARS. The seven crewmembers of the Mars 160 mission finally arrived at FMARS after a lengthy weather delay. Paul talks about the journey and what lies ahead. Mars 160 crewmember Annalea Beattie explains why geological field drawing will be important for astronauts exploring the Red Planet. Annalea Beattie discusses the "Dare Demo Dome" designed by her fellow Mars 160 crewmember Yusuke Murakami. Annalea Beattie talks about life and work inside the habitat in the Utah Desert that she and her fellow Mars 160 crewmembers call home. Annalea Beattie talks about the science work she and her fellow Mars 160 crewmembers are performing in the Utah desert. A Mars 160 Crew Message: CapCom, We Hear You! Mars 160 crewmember Annalea Beattie details how the Mars Society simulation stays in touch with Mission Control from their home base in Utah. Annalea Beattie and her fellow Mars 160 crewmembers have some new neighbors in the Utah desert — researchers testing out technology for future Red Planet rovers. Mars 160 crewmember Annalea Beattie describes what it's like to draw rock formations while wearing a spacesuit — and why it will be important for future Red Planet explorers to make such field sketches. Annalea Beattie describes what a typical day is like for her and her fellow Mars 160 crewmembers. Mars 160 crewmember Annalea Beattie describes an extravehicular activity (EVA) in the Utah desert. Here's what it takes to get outside the habitat for a science mission. Mars 160 crewmember Annalea Beattie is chronicling life and science on The Mars Society's Twin Desert-Arctic Analog simulation. This is her first dispatch. A 160-day-long simulated Red Planet mission began today (Sept. 24) at the Mars Desert Research Station (MDRS), a facility in the Utah desert operated by nonprofit group The Mars Society. On Saturday (Sept. 24), the crewmembers of the Mars 160 mission — who hail from France, Japan, Russia, Australia, India and Canada — will begin work at the Mars Desert Research Station (MDRS), a facility in Utah run by the Mars Society. Alexandre Mangeot is a French aerospace engineer. He got his engineering master's degree from ParisTech Arts et Métiers University. He was hired by CNES (the French space agency) for a 3-year research grant to obtain his PhD. Hybrid space propulsion engines was the topic of the study, with both experimental and numerical approaches. He worked for a year and a half for Expliseat, a startup to design the lightest economical aircraft seat of the market. He was mainly in charge of the design of the seat accessories. Lately, he concluded a postdoc position during which he completed his numerical approach on hybrid rockets. He has previous experience at MDRS in 2012 (Crew 113) and in 2014 (Crew 143), and he has participated in various Mars Society events both in US and Europe. During his free time, he enjoys paragliding and traveling. Yusuke Murakami is a Japanese designer and researcher of architecture especially designed for extreme environments. He got his master's degree in environmental design and governance from Keio University. He has previous experience at MDRS in 2014 (Crew 144), and also spent 15 months in Antarctica on the wintering crew of the 50th Japanese Antarctica Research Expedition. He has participated on other expeditions — to Mt. Everest Base Camp as a base camp engineer and to Mt. Fuji Weather Station, for example. He has also trained within the Japan Aerospace Exploration Agency's Isolation Chamber. After the April 2015 earthquake in Nepal, Yusuke started a project called "Dare Demo Dome" (Dome for Everyone), to supply temporary dome houses for the victims; the assembly systems were inspired by a space building concept. He also has a weekly radio program called "On the Planet," which airs nationwide in Japan. Anastasiya Stepanova is from Moscow, Russia. She has a master’s degree in journalism from Moscow State University and studied space journalism for four years under cosmonaut Yuriy Baturin. Her diploma work was in "space journalism," a new field of research at the school. Anastasiya is a certified rescuer and served in the public search-and-rescue squad known as "SpasRezerv." Currently she is taking a second degree in engineering and robotics at Bauman Moscow State Technical University. She is a co-author of a book for teenagers about space titled "I Wish You a Good Flight!" This book is an easy and entertaining way for readers to get to know about space history, life there nowadays and what to do to become an astronaut. Anastasiya is also a Mars One "Round III" applicant. She participates in many different space projects to raise interest in space exploration. Her dream, in addition to flying to Mars, is to unite the whole world in one goal — space exploration! Claude-Michel is from Montréal, Québec, Canada. He graduated from Université de Montréal in physics in 2007 and from École Polytechnique Montréal in physics engineering in 2012. He was a participant in the 2012 Space Study Program of the International Space University held in Melbourne, Florida with NASA's Kennedy Space Center, where he helped lead part of the "Space: One Giant Leap for Education" project. Jon lives in Canberra, Australia's bush capital, and is a general practioner in geology. He started out life as a palaeontologist, doing honours in Silurian palaeoecology at the University of Tasmania. He then became an exploration geologist in South Australia, looking for Permian coal and Cambrian oil and sodium carbonate salts. That was followed by a PhD at Flinders University in Adelaide on the deposition and diagenesis of Cambrian limestones, including fossil sponge-microbe reefs. After six months in marine surveys of the Great Australian Bight for the federal government, he joined a resource company and spent the next decade in exploration. This included looking for gold and nickel near Kamblada, Western Australia; copper, gold, and zinc exploration in Queensland and South Australia; copper and gold exploration in the Philippines, Chile and South Australia; and gold in Victoria. He then taught geology at the Australian National University for several years before joining the federal government at Geoscience Australia, working in salinity management in Queensland, Victoria, South Australia, and NSW; groundwater exploration in NSW; and precompetitive mineral exploration in Victoria, as well as taking part in a review of rare earth, lithium, and potash potential in Australian salt lakes. Jon has been interested in Mars since he was about 10 years old, before people even walked on the moon. Since finding out about Mars Society Australia in 2001, he has taken part in six expeditions to inland Australia, one to New Zealand, one to India and three MDRS rotations. His Martian interests include Martian geology and geomorphology and their terrestrial analogues, astrobiology, exploration technologies (especially habitats, vehicles, and suits), mission architectures, and human factors. He currently serves as president on MSA, is on the Mars Society International Steering Committee, and is director of science at MDRS. In the rest of his life he is married to Anna, a community maternal and child health nurse, has two grown-up and married daughters; one has an MA in museums and collections and works in a local heritage library, and the other is doing a PhD in cancer research. They have a cat and an elderly guinea pig for company. He likes watching and reading SF, history and the interaction of science and theology. Jon also scuba dives, hikes and camps when he can, and is a volunteer in the local rural fire brigade. Annalea Beattie is an artist and educator who lives and works in Melbourne. Through an art practice based in space science, her research considers how art might activate isolated communities living in extreme environments, contributing to social cohesion, performance and quality of life. Originally from India, Anushree is currently living in Colchester, England. Her educational journey started off as a student of literature, history and music, which culminated in obtaining a Master of Arts in anthropology, specializing in its biological branch (just out of curiosity), particularly the "paleo" aspect of it, which exposed her to the adventure of exploration. Then she came to know about the prospect of "life beyond earth" (astrobiology — which was called "space biology" back then) which she found extremely fascinating. She transitioned from social sciences to natural sciences solely to follow her passion for astrobiology, which was challenging for an art student. She will be receiving her second master's degree — Master of Science in Biotechnology — from the University of Essex, UK. She studied 6-million-year-old evaporite deposits (halite crystals) called Messinian halite, which are the product of the Messinian Salinity Crisis in the Mediterranean region, from geo-microbiological, biogeographical, and astrobiological perspectives. She aspires to obtain her PhD in the future and in her personal time enjoys music, travelling, photography, watching birds and reading (specifically biographies, poetry, and philosophy). Paul Knightly is an environmental geologist and is currently working on a PhD in Planetary Science at the University of Arkansas. He brings extensive experience working as a field geologist monitoring groundwater and soil quality and will be seeking to better understand the permafrost and ice conditions in the vicinity of FMARS. He served as the Crew Geologist and Commander at MDRS on Crew 142 in November 2014 and joins other crewmates from Crew 142 on MA160. Recently married, Paul is enjoying life as a newlywed with his wife, Jessica, at their home in Fayetteville, Arkansas. In his spare time, he enjoys an array of outdoor activities and developing his skills as an amateur landscape and weather photographer, which includes spending a few weekends each spring storm-chasing across America's Great Plains.